A big THANK YOU to all who attended last Wednesday night’s (May 9th) meeting. It was a lively one, with lots of discussion (both during and long after). After our meeting, Karen shared a special project she’s working on with her church. It involves sending items such as colored pencils, crayons, coloring books, and a few other things to children in Kenya, kids who are thrilled to receive just a #2 pencil. We’re so grateful to Karen for bringing it to our attention. This is a wonderful program! Let’s help Karen bring some simple joy to the kids of Kenya! 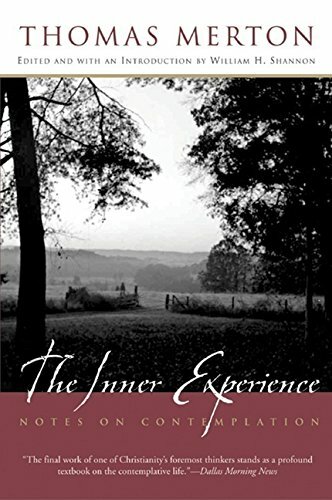 In our 2nd Anniversary meeting May 9th we talked through the Introduction and Chapter 1 (“A Preliminary Warning”) of Thomas Merton’s book The Inner Experience. We started in on Chapter 2 (“The Awakening of the Inner Self”) when we ran out of time. At our next meeting – Wednesday, June 13th – we’ll continue with Chapters 2 & 3 (“Society and the Inner Self”). Read Chapter 4 (“Christian Contemplation”), too. Just in case. SPECIAL NOTE: If Fr. Patrick is back in town by then, we may be in for a treat at next month’s meeting. He’s given talks/seminars on The Inner Experience. I’ve asked Fr. Patrick to share his insights with us regarding this, one of his favorite Merton books. I’m not sure what form his discussion will take. But anything Fr. Patrick does is worth hearing. I’ve been asked to send a reminder e-mail a day or so before our next meeting. So that’s what I’ll do. Oh, one more thing. We’ll watch the next part of the Merton video as well. It’s one of my favorites. We hope to see you at our June 13th meeting! P.S. Once we’ve created the flyer for our June meeting, we’ll post it.